Robyn Malcolm is a New Zealand television and theatre actress. She has appeared in numerous New Zealand TV shows and has toured New Zealand with a number of theatre productions. Malcolm attended Ashburton College, and graduated from Toi Whakaari in 1987. She won an International Actors Fellowship at the Globe Theatre in London for 2003. She is well known to New Zealanders from her role as Nurse Ellen Crozier in the television series Shortland Street. The role earned her a nomination for Best Actress at the 1998 TV Guide Television Awards. 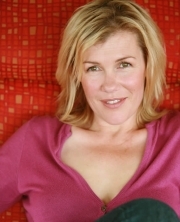 In 2002 she won another Best Actress nomination for her lead role in television feature, Clare, based on the cervical cancer experiment at National Women's Hospital which resulted in the Cartwright Inquiry. In 1999, Robyn Malcolm was one of the founding members of the New Zealand Actors' Company along with Tim Balme, Katie Wolfe and Simon Bennett. The company produced and toured a number of successful stage productions throughout New Zealand. Malcolm has acted in the feature films: Absent Without Leave directed by John Laing; The Last Tattoo directed by John Reid; Gaylene Preston's Perfect Strangers; and Christine Jeffs', Sylvia. She also played the part of Morwen in Peter Jackson's Lord of the Rings. In 2005, Malcolm took on the role of Cheryl West, matriarch of the West family, in Outrageous Fortune. She has won NZ television awards for the role including the likes of: the Qantas TV Awards Best Actress in 2005 and 2008, TV Guide Best Actress in 2006, 2007, 2008, 2009, 2010 and 2011 and Air NZ Screen Awards Best Actress in 2007. She won the Woman's Day Readers’ Choice Award for Favourite New Zealand Female Personality in 2005, and New Zealand's sexiest woman at the 2007 TV Guide Best on the Box awards. She has two sons. Her sister is married to Roger Sutton, the incoming CEO of the Canterbury Earthquake Recovery Authority. Malcolm voiced Green Party of Aotearoa New Zealand advertisements for the New Zealand general election, 2008. She has helped spearhead an actors' union campaign to negotiate standard contracts for actors in the Hobbit films. The producers refused, saying that collective bargaining would be considered price-fixing and therefore illegal under New Zealand law. The situation escalated into international calls for an actors' boycott of the films, but the boycott was called off. Several days later, the producers said they were considering moving the films to another country as they could not be guaranteed stability in New Zealand. In response, the ruling National Party made several controversial changes to New Zealand's employment laws, and passed legislation explicitly controlling people working on the Hobbit movies. Whole or part of the information contained in this card come from the Wikipedia article "Robyn Malcolm", licensed under CC-BY-SA full list of contributors here.